Cardio-P has been developed to help maintain normal blood pressure levels when used in conjunction with a healthy diet. Contains potassium, thiamine and magnesium. High blood pressure (hypertension) is a medical condition resulting in increased blood pressure in the arteries. A person with high blood pressure may feel well and look well, the only to check if you have high blood pressure is to have it measured. Potassium plays a key role in balancing levels of sodium and other important minerals that are linked to high blood pressure. Potassium is found in many foods and drinks including fruits, vegetables, potatoes, milk and some snack foods. Thiamine contributes to the normal function of the heart and normal function of the nervous system. Magnesium is an essential mineral required for the maintenance of normal muscle contraction, including the heart muscle. Potassium Chloride, Magnesium Oxide, Thiamine Hcl (Vitamin B1), Di Calcium Phosphate, Microcrystalline Cellulose BP, Silica, Magnesium Stearate. Food supplements should not be used as a substitute to a varied diet. If you are pregnant, breastfeeding, taking any medications or under medical supervision, please consult your doctor or healthcare professional before use. Avoid taking potassium supplements if you have any form of kidney disease. 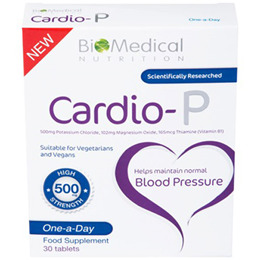 Below are reviews of Cardio-P - Blood Pressure - 30 Tablets by bodykind customers. If you have tried this product we'd love to hear what you think so please leave a review.